HomeNancy's blogsSpiritual MaturityHow Can We Sin? Sometimes we forget that the physical world was created to reflect the spiritual world. For example, do you realize that the earthly Tabernacle was a copy of the heavenly Tabernacle (Hebrews 8:1-5 NLT)? Likewise, YHVH shared his Torah on earth so that earth’s inhabitants could reflect heaven’s inhabitants. Torah has not been replaced either in heaven or on earth. Yeshua Himself stated that until heaven and earth pass away, not one jot or tittle of the Torah will pass away (Matt. 5:18). Yeshua’s earthly kingdom will be a reflection of the heavenly kingdom. The old covenant was replaced, not because the laws were faulty, but because the people were faulty (Hebrews 8:9). The first covenant did not work out because the people did not keep their side of the bargain. In other words, they did not obey YHVH’s laws. If the law was faulty or obsolete, why would YHVH want to put it on our minds and write it on our hearts (Hebrews 8:10)? YHVH was not teaching the people a set of random laws just for the earth, but was teaching the people how His kingdom operates in heaven. Yeshua taught us much about the kingdom of heaven (Matt 5-7). The gospel of Matthew depicts Yeshua as King just as the gospel of Mark depicts Yeshua as servant. He came the first time to serve us; He will return to reign as our King. Yeshua made mention of the new covenant (Luke 22:20), but the point was that His shed blood is the payment for our sins. We can be forgiven and restored to YHVH, if we ask. After being exiled in Babylon, Jewish leaders and teachers determined that people were unable to keep Torah and set about making a “fence” around it, to ensure that Torah would not be broken. They were attempting to fix something only YHVH can fix. The “fence” focused on the letter of the law, not the spirit of the law. The “fence” consisted of man-made laws that added to and subtracted from Torah in direct violation of YHVH’s command (Deut 4:2, 12:32). In fact, by the time Yeshua came to earth the first time, there was more than one “fence” in place. Each additional fence drew people further from the Torah, and consequently further from YHVH. Yeshua argued with the Pharisees about the “fences,” not about the Torah. Yeshua violated the “fences” but He never violated Torah. Yeshua is the living Torah and He is not divided against Himself. In 2 Corinthians 3, Paul talks about the new covenant, not the new Torah. The Torah is still in place; it is the guilt and condemnation that have been removed through the shed blood of Yeshua. The law is no longer just written on stone, but is written on hearts and minds. Perhaps the stone represents the stony hearts that kept turning away from YHVH. Now that we have the fullness of the Holy Spirit, our hearts need no longer be stony, but instead be yielded to YHVH. There are many Christians today who firmly believe that the Torah is no longer relevant. However, if they are not following YHVH’s law, then what are they doing? Where there is no law, people will create a law for themselves, for there is an inherent need for order and structure. We are created in the image of YHVH, Who is the epitome of order. Do we truly think we can improve on YHVH’s law? Dear Brothers and Sisters who insist that Torah is no longer in effect, how is it that we are still capable of sin? The definition of sin is “a transgression of the law of God” (Merriam-Webster). If Torah is not God’s law, then what is? If there is no law, then there can be no sin. If there is no law, then there will be no order or structure, only chaos. So, my dear brothers and sisters, this is the point: You died to the power of the law when you died with Christ. And now you are united with the one who was raised from the dead. As a result, we can produce a harvest of good deeds for God. When we were controlled by our old nature, sinful desires were at work within us, and the law aroused these evil desires that produced a harvest of sinful deeds, resulting in death. But now we have been released from the law, for we died to it and are no longer captive to its power. Now we can serve God, not in the old way of obeying the letter of the law, but in the new way of living in the Spirit. We are dead to the law only in the fact that we no longer bear the punishment for our transgressions because Yeshua bore our punishment for us. In that way, our focus can be on obeying the Spirit of the law. When we sin, we can ask YHVH for forgiveness and receive forgiveness through the blood of Yeshua. Those who sin and do not ask forgiveness are still held accountable for their sins. So, the difference is not in the law, but in who bears the penalty for transgressing the law. On our own, we are not able to keep the law perfectly. However, we are no longer on our own. We have access to the fullness of the Holy Spirit, who empowers us to obey the law as YHVH requires. When we stray from the Spirit and sin, our guilt and condemnation are covered by the blood of Yeshua. When we are born again, our spirit is regenerated, sealed and perfectly able to understand and follow Torah. Where we still need Yeshua’s atonement is for our souls (minds) which need to be renewed (Rom 12:2). YHVH is still King in heaven and His laws are still intact in heaven. 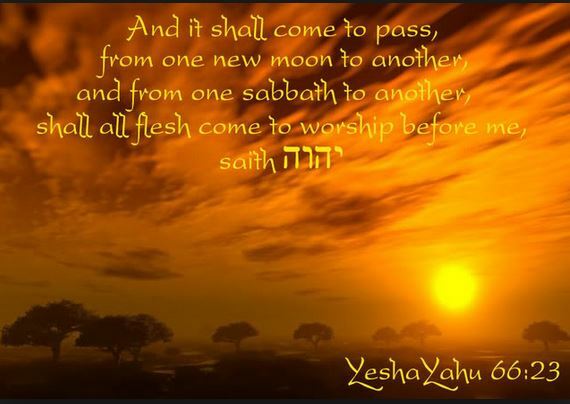 Those who reside in heaven obey YHVH’s every command in the spiritual realm. In the physical realm, that is, the earth, citizens of YHVH’s kingdom are still working to fully reflect the Kingdom of Heaven. Even in our imperfections, we can, through Yeshua’s atoning blood, stay connected to YHVH as we “work out our salvation” (Phil 2:12 NLT). One day, earth will be the perfect reflection of heaven as YHVH has always intended. Previous PostWhat is True Delight?Next PostHow Can We Live?